What the Heck Is Toothpaste Anyway? It's been part of humanity's hygiene regimen for more than 4,000 years, but have you ever stopped to think what's actually in the stuff you're smearing across your teeth? The ingredients of modern toothpaste may read like a mad scientist's shopping list, but they're far better than what our ancestors had to endure for healthy teeth. Technically known as dentifrice, toothpaste today comes in a variety of forms from pastes and gels to powders and sodas. But whatever form they take, all toothpastes do the same thing: Gently scrape the film of bacteria and food particulate from the surface of your teeth. Well, to be fair, it's primarily the mechanical action of your toothbrush that actually dislodges detritus from your teeth, but toothpaste works to enhance the effectiveness of that motion. And over the 700-1,000 times you brush every year (you are brushing twice a day, right? RIGHT?) the benefits that toothpaste provide really add up. But first, let's take a look at where we've been. Humans have so many teeth for a reason: Over a lifetime of use—especially the hard-living ways of our ancestors who barely averaged 30 year life spans—teeth wear out and fall out. Heck, as late as the turn of the 20th century, the most sought-after feature in prospective partners remained "a full set of teeth." That still holds true today. A 2013 study by the University of Leeds found that people with white, evenly spaced teeth are consistently viewed as more attractive than their snaggle-toothed peers. With oral health acting as a major indicator of reproductive fitness, humans have long sought to maintain their pearly whites for as long as possible. The first toothpastes performed the exact same function as modern ones—cleaning the teeth and gums while freshening the breath and preventing decay—but with more rudimentary ingredients. The earliest discovered concoction mixed the powdered ashes of an ox's hoof with carbonized eggshells and pumice. These combined to form a potent abrasive capable of scrubbing the teeth without the need for a toothbrush. The Greeks and Romans took it a step further by adding crushed bone and seashells to the mix, while the Chinese instead opted for a combination of ginseng, herbs, and salt. However, it wasn't until the 19th century that toothpaste as we know it came to be. Tooth powder is credited as a British invention growing out of the homemade poultices contrived out of stuff like of chalk, charcoal, brick dust, salt—even burnt bread and cinnamon. Many of these early mixtures—especially the "patented" (read: snake oil) commercial varieties—proved to be too abrasive and wound up taking off bits of enamel in addition to plaque. Still tooth powders remained the preferred cleaning method until WWI. By the turn of the 20th Century, toothpaste technology had thankfully evolved from rubbing crushed minerals on our teeth to using a paste-like mixture of hydrogen peroxide and baking soda. Around the same time, a Connecticut doctor, Dr. Washington Sheffield, invented the collapsible toothpaste tube. He made it out of lead—because just look what it did for the Romans—but combined with the relative ease of applying a paste from a versus a powder, tubed toothpaste quickly usurped tooth powders. Similarly, fluoride began being added to toothpastes in the 1890s. The first brand to employ fluoride was Germany's "Tanagra," manufactured by the Karl F. Toellner Company with calcium fluoride. Incredibly, it took the ADA (American Dental Association) another 60 years—and a privately funded study by Proctor & Gamble lasting more than a decade—to approve its use in domestic toothpastes. Crest was the first American toothpaste to include fluoride when it debuted in 1955. Five years later, the ADA reversed its position of fluoride, stating "Crest has been shown to be an effective anti-cavity (decay preventative) dentifrice that can be of significant value when used in a conscientiously applied program of oral hygiene and regular professional care." The ADA now unreservedly endorses the use of fluoride in both consumer products and community water supplies. Today's toothpastes are marvels of modern chemistry, often containing dozens of ingredients. However, they all share a common set of active ingredient classes—abrasives, fluorides, and surfactants—in addition to a number of miscellaneous inactive components. Water also constitutes between 20 and 40 percent of the product by weight. Abrasives can make up as much as half of a tube of toothpaste. They serve to scrub the enamel of plaque, which minimizes the formation of cavities and other forms of tooth decay. Aluminum hydroxide, calcium carbonate, calcium phosphate, silicas—even household baking soda—can be employed for this role. However, like the Victorian era tooth powders, too much abrasive can harm your teeth more than they help. In weaker concentrations, abrasives can help manage stains from coffee and smoking, while harsher abrasives like the polish your dentist buffs onto your teeth can easily strip a teeth of its enamel if misused. Fluorides form another corner of the toothpaste ingredient trinity, acting to strengthen tooth enamel and counter the formation of cavities and gingivitis. Sodium fluoride is the most commonly used form both in consumer products and water supplies, constituting only about 1000 ppm of toothpaste, or about three tenths of one percent of the total product weight. This small amount isn't enough to make you ill if you inadvertently swallow some, though in large doses it can be a health hazard—which is why eating toothpaste like it's astronaut food is generally frowned upon by the professional dental establishment. The third major component of modern toothpastes, surfactants, are a class of detergents employed as foaming agents. This foam ensures that the abrasive and fluoridated components are evenly distributed across the entire tooth surface. 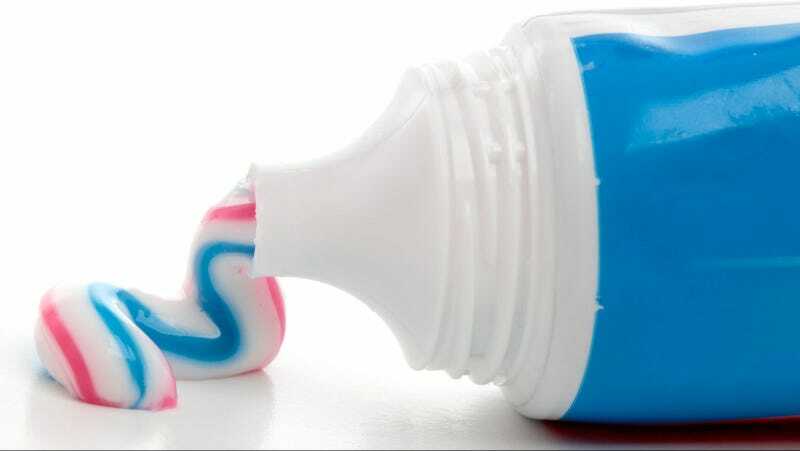 The rest of toothpaste is composed of a number of chemical stabilizers and humectants like glycol, propylene glycol, or glycerol, which keep the paste from drying out in the tube. Antibacterial agents like Triclosan or zinc chloride are also common components, which kill the germs that cause gingivitis, as are flavorants which give the toothpaste its flavor and appearance; and sometimes also remineralizers like calcium phosphate to aid in rebuilding tooth enamel.